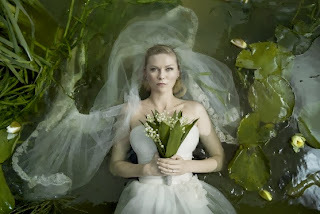 Justine (Kirsten Dunst) is a troubled new bride who thinks the world will end in five days in "Melancholia." "Melancholia" may be 2011′s most polarizing choice as one of the year's best films, considering that many people regard it as one of the worst. That’s only a paradox if you think movies should appeal to as wide an audience as possible, because this unsettling, unconventional and uncompromisingly grim nightmare is the opposite of a feel-good crowd-pleaser. Love it or hate it, "Melancholia" is hauntingly unforgettable. Director/writer Lars von Trier’s disturbingly downbeat drama takes place in two parts, preceded by a wordless “overture” montage of about two dozen striking images both hyper-real and surreal. Lushly photographed in the ultra-slow-motion speed the director has called “monumental time,” they include a majestic black horse collapsing backward, a desperate woman leaving impossibly deep footprints in a golf green as she carries a child, a forced-perspective sundial that appears to tower 100 feet above a mansion’s manicured grounds and a bride struggling against thick ropes of clinging gray yarn. Oh, and there’s also a shot of the world being destroyed in a literally earth-shattering collision with a massive rogue planet. All of those eerie but beautiful moments eventually make sense, but don’t expect answers right away. The movie’s first half is devoted to an uncomfortably lengthy nighttime wedding reception at a private estate so luxurious it has its own 18-hole golf course. Blond and voluptuously lovely Justine (Kirsten Dunst) is a new bride whose initial giddy playfulness turns into what looks like irrational, rude and self-destructive behavior. Her indignant sister Claire (Charlotte Gainsbourg) and resentful brother-in-law John (Kiefer Sutherland) have financed the outrageously lavish affair, and aren’t pleased that Justine doesn’t take her role in the event seriously. But Justine’s seeming indifference and immaturity are masking a sense of quietly maddening terror. Whatever she knows that she’s not sharing, it’s obviously not good news. Part Two takes place over the next several days at the mansion, where the only inhabitants are Claire and John, their young son Leo, Justine and a butler referred to as Little Father. Scientifically minded John has tried to keep Claire from going online to read about an approaching planet named Melancholia. John insists that doomsayers predicting Melancholia will impact the earth are crackpots. Frequently referencing his own telescope, he calmly maintains that scientists who have announced that Melancholia will travel harmlessly past Earth are correct. Justine is one of the doubters, sinking into a crushing depression that keeps her from bathing or eating. When she finally emerges from her near catatonia into a state of cold resignation, she is certain not only that the planet will be destroyed, but that life does not exist anywhere else in the universe. Dunst and Gainsbourg are excellent as sisters whose roles shift when the possible end of the world gets closer. Sutherland perfectly captures the relentlessly rational John’s optimism, as well as his eventual sense of betrayal and doubt. His even-voiced attempt to calm Claire when she grows short of breath watching Melancholia approach is made more spine-chilling by his lack of concern. “It’s taking part of our atmosphere,” he states with detached awe. The oncoming planet Melancholia can be seen as a symbol of real-life horrors such as disease, debt, destruction, death or something as obvious as depression itself. By translating the very uncommercial theme of existential despair into a human drama where fighting back is impossible and surrender the only option, Lars von Trier ironically has produced the most powerful and enduring film of the year.